If you want to support someone…you need to ASK them what actions they would actually find supportive. Well, duh, you might say. Isn’t this obvious? Perhaps not. 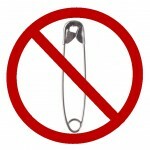 I’ve seen a lot of faux support circulating on social media recently, starting with the whole “wear a safety pin to show you’re an ally” meme on Twitter after Trump’s election. In response to his comments about starting a registry of Muslims, some of my friends have posted Facebook photos of themselves holding up “I am a Muslim” signs. I will not presume to speak for Muslims or people of color about how they feel about these actions. (Others have done so already; check out the Safety Pin Box, created by two African American women in response to the whole safety pin thing.) But I can speak from my own lifelong experiences of sexism and homophobia. And I will tell you that putting one of those rainbow “Safe Space” stickers on your window or posting a selfie holding a sign declaring “I Am a Lesbian” if you aren’t DOESN’T really make me safer in the world. Have you contributed time and/or money to gay rights causes? More importantly, would you – or have you – intervened when someone around has attacked or denigrated gays, verbally or physically? Those are actions that feel like support to me. It’s kinda like gift-giving: do you give your loved ones the gifts THEY really want, or things that YOU want them to have? (My favorite resource on this issue: Gary Chapman’s 5 love languages.) Support is supposed to benefit the person it is given to, not the person giving it! If you want to support someone…you need to ASK them what actions they would actually find supportive. Most of us get this concept when we’re talking about a friend who’s had a new baby or is going through a divorce or a death in the family – we ask what help they need. If you want to support members of a targeted group – but you don’t actually KNOW anybody who belongs to that group – what does that say about your supposed commitment to diversity?